This sand timer is perfect for timing cooking, playing games, exercising and so on and also a wonderful decoration for your home and office. The sand runs smoothly, looks natural and beautiful. 5/15/30 minutes timer for your options. Great for timing cooking, playing games, exercising and so on. Perfect for home decoration, office desk decoration, birthday gift, Christmas gift, etc. 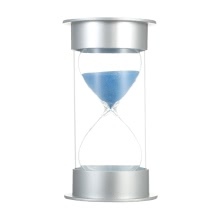 It is a sand timer made for games, not a precise timing device. 10% time deviation may exist.